in discrete and module packages. Power semiconductors are components used to convert energy from one form to another at various stages between the points of energy generation and energy consumption. A power semiconductor component can take the form of a discrete transistor, thyristor, or diode; or if a higher level of current or integration is required, the component can take the form of a multi-chip module, which contains more than one of these devices in a desired configuration or topology. At Littelfuse, we understand that a wide variety of energy conversion requirements calls for a wide variety of power semiconductors. Our comprehensive portfolio includes thyristors, rectifiers and fast recovery diodes, IGBTs, and wide band gap devices – all in a variety of discrete and multi-chip module formats, and all designed to help you flexibly manage your power system with elegance and efficiency. Traces the evolution of Silicon Carbide over the last few decades and offers an overview of their commercial prospects for the future. Within the past two years, commercially available 1200 V SiC MOSFETs have come a long way in terms of quality: channel mobility has risen to suitable levels, oxide lifetimes have reached an acceptable level for most mainstream industrial designs, and threshold voltages have become increasingly stable. Long-term reliability, parametric stability, and device ruggedness are also showing steady improvement. 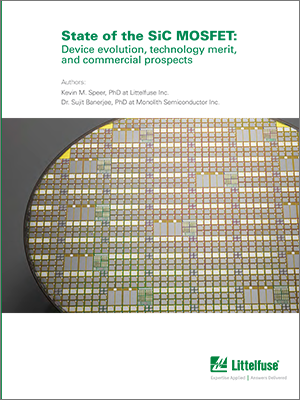 This white paper outlines the tools and techniques used to verify the quality and performance of the new line of SiC MOSFETs soon to be introduced by Littelfuse and Monolith Semiconductor. Visit our new Silicon Carbide Technical Center for detailed information about SiC material properties and uses, design videos, evaluation kits, application support, and product information.